A counterpart to the Bottega, the Varenka was a one-and-a-half-story building with a garage-like door that was largely used for furniture storage and possibly sales. 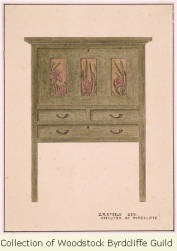 Although Byrdcliffe furniture was stored and sold at the Varenka, it was also shipped to New York City where it was sold at Altman’s and McCreery’s furniture stores. Indeed, one of the reasons for founding the colony in Woodstock was its proximity to New York, a major commercial hub for decorative art. Although people such as Ben Webster claim, “they never had the sense to establish a trademark identity tag such as BYRDCLIFFE FURNITURE and knock up the price 50%.” there is some evidence that Whitehead and his craftspeople had some business savvy and attempted some advertising. Byrdcliffe did develop a signature mark and created have some quality, full color drawings, complete with prices and dimensions, and distributed them for advertising purposes. This strategy allowed customers to see, and perhaps purchase, Byrdcliffe goods without having the physical items on hand. Aside from these tactics, evidence suggests that designers Zulma Steele and Edna Walker may have offered Byrdcliffe furniture to their clients in their home décor business in New York. 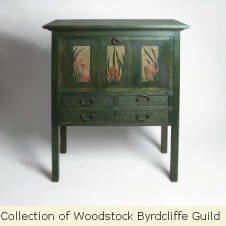 The price of Byrdcliffe goods was substantial, but comparable with other Arts and Crafts furniture, notably that produced by the Rose Valley Association, a similar Arts and Crafts community located outside Philadelphia. For example, a Byrdcliffe settee was listed for $115; a oak tulip flower cabinet, $130; and the tulip carved dining room table pictured below, $120. However, these were not merely stock items; many were customizable with different carvings and panels by Byrdcliffe artists and designers to suit any taste or aesthetic. This is currently a working artist's home and studio, please do not disturb. 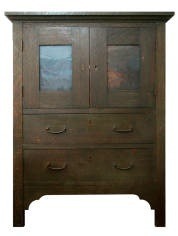 Thomas A. Guiler, “The Varenka,” UpstateHistorical, accessed April 18, 2019, http://upstatehistorical.org/items/show/9. Evers, Alf. The Catskills: From Wilderness to Woodstock. Garden City, NY: Doubleday & Company, Inc., 1972. Evers, Alf. Woodstock: History of an American Town. Woodstock, NY: Overlook Press, 1987. Green, Nancy E., ed. Byrdcliffe: An American Arts and Crafts Colony. Ithaca, NY: Herbert F. Johnson Museum of Art, 2004. Heppner, Richard R., ed. Woodstock Years: Publications of the Woodstock Historical Society. 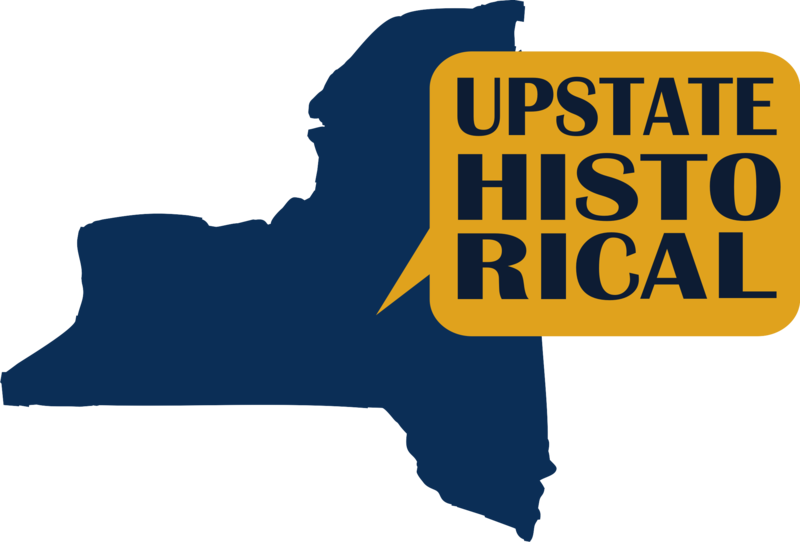 Woodstock, NY: The Historical Society of Woodstock, n.d. The Historical Society of Woodstock. Sanborn, Alvan, F. “Leaders in American Arts and Crafts,” Good Housekeeping (February, 1907). Smith, A. M. Woodstock: History and Hearsay. Woodstock, N.Y.: Woodstock Arts, 2006. The Winterthur Library: Joseph Downs Collection of Manuscripts and Printed Ephemera, Collection 209.